Today’s accomplishments: Typing and cleaning up more than 4,000 words of the current version of Volume Four, and smacking a wasp that had gotten into the house before Brom could eat it. Today’s frequently-asked question: How many books have you written? If the questioner means, ‘How many books have you written, published or not, the answer is: I couldn’t possibly count them. I’m currently revising two books, and I have two more waiting in the wings with their early chapters and notes. And, back in my practicing days, I wrote an adult novel, a series of graphic novels, and dozens–perhaps hundreds–of novels that end at Chapter 3, where the writing started to get hard, and I gave up. All of those binders and notebooks are full of my writing: hundreds of poems, dozens of short stories, and many novels — some finished, and some that never will be finished. There is another row of binders that can’t be seen on the shelf up above, and another stack of currently-in-use books and folders sits on my desk. 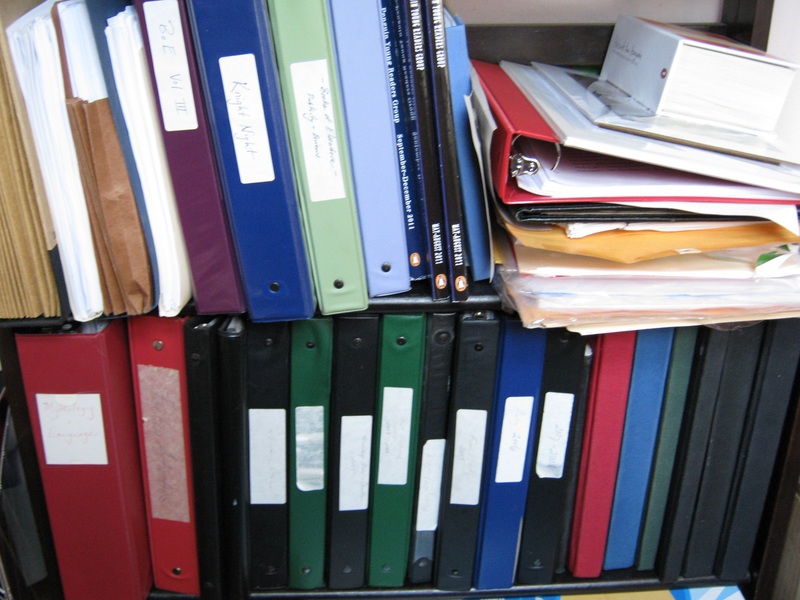 I’ve never counted to see when and where I reached a million words (Ray Bradbury once said, “If you want to be a writer, write a million words,” which I think is pretty good advice) but I’m sure that most of those first million are here, in these folders. And I’m grateful that no one will ever get to read most of them.